PARTNERSHIP with the younger generation is the most essential alliance in addressing climate change as they adhere to the meaning of conservation implemented in the educational system which is proven to be beneficial for future generations to come. However, failure to do so would betray the children of tomorrow. These were the key points highlighted during a dialogue on ‘Responding to Climate Change: The need for New Partnerships and Alliances’ in accordance with the National Environment Conference (NEC) 2013 initiated by Asia Inc Forum yesterday. The panel of speakers included the Permanent Secretary at the Ministry of Industry and Primary Resources (MIPR), Hjh Normah Suria Hayati binti Pehin Jawatan Dalam Seri Maharaja Dato Seri Utama (Dr) Hj Awg Mohd Jamil Al-Sufri; British High Commissioner to Brunei Darussalam, Rob Fenn; and Executive Director, Greenpeace Southeast Asia from the Philippines, Von Hernandez. 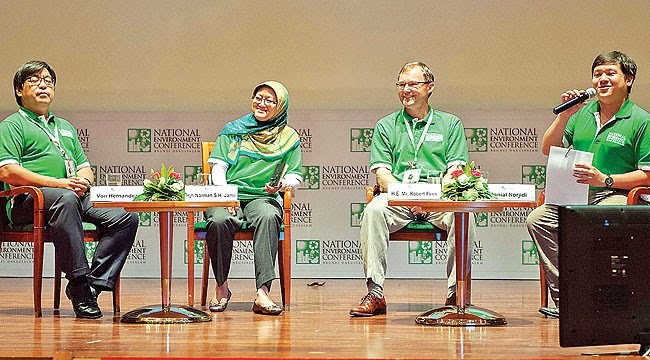 Moderating the session, Borneo Bulletin senior journalist Danial Norjidi posed the question on the importance of forging new partnerships to fight global warming. The permanent secretary said that bridging the generation gap between parents and children is essential, which the government has difficulties executing. “We have to get our children to understand the meaning of conservation because it is them who will inherit the benefits and should not repeat the mistakes of this generation,” she said. Hjh Normah believes that the partnership should start from school. “First we need to get students involved and make them understand all about climate change,” she said. The MIPR and the Ministry of Education are working on incorporating topics on addressing climate change in school such as the important of forest conservation. She welcomed Non-Government Organisations (NGOs) to come forward to build new partnerships with the MIPR in combating global warming by pitching ideas to further maintain the Heart of Borneo initiatives. “We value our partnerships among countries under the HoB, namely Brunei, Indonesia and Malaysia, but I urge NGOs to come to our HoB Centre located at the ministry or interact with us through our social media portal, such as our Facebook page,” said the permanent secretary. Rob Fenn supported the Brunei initiatives in building a green economy alongside its economic mainstay which is oil and gas. “Initiatives like the Heart of Borneo, Sungei Ingei zoological survey, sustainable forestry, responsible agriculture and fisheries management, and research alliances in Energy, Biodiversity and other clusters are creating a new brand for Brunei. He cited the alliance between scientists using their expertise in studying ecology. “No nation nowadays does cutting-edge research all by itself. Universiti Brunei Darussalam’s (UBD) search for research allies shows the Sultanate is on the right track. The presence of the Vice Chancellor of Loughborough University at UBD’s ‘Brunei Dialogue’ this week underlines how British universities are natural partners for Brunei-based researchers,” he said. Changes in climate affect the average weather conditions that we are accustomed to. Warmer average temperatures will likely lead to hotter days and more frequent and longer heat waves. This could increase the number of heat-related illnesses and deaths. awareness should be raise upon climate change as it will affect us in our natural system.